Last week, we read about the angel Gabriel’s prediction of Jesus’ miraculous birth. 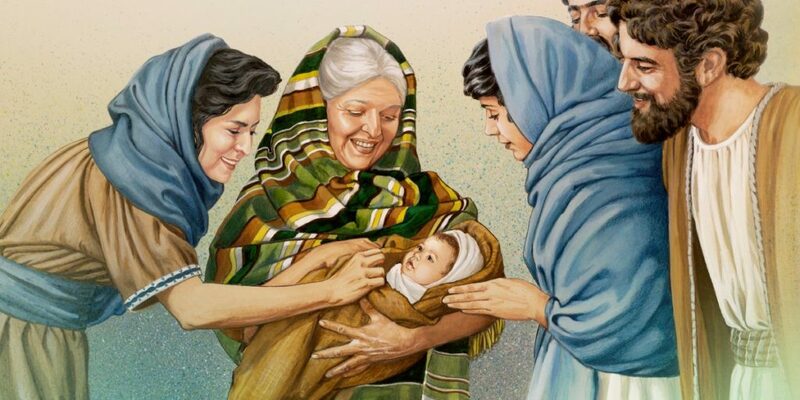 As we continue to unroll Luke’s account of Jesus’ origin and young life, we learn that Mary, now pregnant, went to spend time with her cousin Elizabeth, who lived in ‘the hill country’. That detail reminds me about what happened to young girls who, in the euphemism of my youth, ‘got into trouble’. Their families sent them away to distant relatives to avoid scandal at home. Today’s Gospel focusses on the birth of Jesus’ cousin John the Baptist who, we learn, was just five months older than Jesus. John’s parents’ relatives and neighbours expected that he would be called Zechariah, after his father. But Elizabeth knew, even though Zechariah was unable to speak, that she was to name the baby John. Elizabeth’s busybody neighbours and relatives challenged her. When she held her ground, they gave Zechariah a writing tablet to write down the baby’s name. He wrote, “His name is John.” That settled the matter. It also fulfilled the ‘time’ that the angel Gabriel had predicted, and so Zechariah regained the ability to speak. Today’s Gospel ends with Zechariah proclaiming the hymn that we call the ‘Benedictus’ [Blessed be the God of Israel …]. It connects John (and therefore his cousin Jesus) with both the patriarch Abraham and the great King David. The phrase, “he has looked favourably on his people” underlines why the child was called John; the name John means ‘God has looked favourably’. The Benedictus also looks forward to John’s ministry in the wilderness: ‘you will go before the Lord to prepare his ways, to give knowledge of salvation to his people by forgiveness of their sins’. These details show that Luke wrote a very sophisticated account of the births of John and Jesus – as well as a great piece of storytelling. That prompted me to compare this year’s lectionary Gospel readings for Advent with our sequential reading of Luke’s story. The reading for Advent 1 tells that everyone needs to keep awake for the coming of the Son of Man. Last week and this, the lectionary would have us reading about John preaching and baptizing in the wilderness. Finally, only two days before Christmas, the lectionary for Advent 4 offers the Annunciation, which we read last week. All this made me think about what must be in the minds of the lectionary compilers when they select the readings. By this, I mean, what do they imagine Advent to be? The word Advent means ‘coming’. I ask myself, “Who is coming? What are we waiting for?” Clearly, there are different views about this. At the risk of trying to force my theology down your throats, I am very clear about this in my own mind. Each Advent, I am waiting for the coming of the Christ-child at Christmas. But clearly, other people understand Advent very differently. To read about John the Baptist preaching in the wilderness during Advent implies that John was predicting Jesus’ birth. That does not make sense, because John was only five months old when Jesus was born. We know that because the newly pregnant Mary visited Elizabeth in the sixth month of her pregnancy. John the Baptist may have been ‘great’ – as the Benedictus says – but he couldn’t have been in utero at the same time as he was preaching in the wilderness. Instead, John predicted Jesus’ coming ministry, but that happened thirty years later. Readings about the coming of the Son of Man refer to the final judgement of the nations at end of time. In Christian theology that would have to mean the Second Coming of Jesus. That this does not make sense to me in the context of the ‘Jesus story’. Why would we look forward to the Second Coming before we have celebrated the first one? Parenthetically, the final judgement speaks to a very Protestant group of theologies in which we are all inextricably bound by Original Sin. Extreme Protestant versions of this theology include the idea of predestination. This is that God’s elect (selected or chosen ones) are those who will receive salvation when they die. So-called ‘conditional election’ means that God selected from before time began those that he believes will have faith in Christ when they get to live on Earth. Whether they actually receive salvation depends on how they spend their earthly lives. Unconditional election means that God chooses the elect irrespective of their earthly behaviour. The ‘worst’ form is ‘double predestination’ in which God not only chooses the elect ahead of time, but also decrees who will be damned. Let me return to my own Advent theology. Incarnation is the context in which the Christmas story makes the most sense to me. The word ‘incarnation’ means ‘made flesh’. As I said last week, the idea that God became flesh in the form of the Christ-child is a metaphor for saying that there is a divine spark within each of us. I reflect that the humanity of the Christ-child is how that metaphor plays out for we ordinary, earthly beings. Like us, God brought Jesus into this world in the usual messy way. Like Jesus, we are part of God’s good Creation. This is a completely different view of the world from the idea that we were born into sin. That view separates us completely from the Christ-child, who was perfect. Inescapable sinfulness says to me (at least) that I have been set up to fail, however hard I try to lead a good life. My understanding of a compassionate and loving God is that I was born as part of God’s good Creation, even if I can’t measure up to the standards of the Christ-child. Having been created good rather than sinful makes us truly responsible for our actions. Pelagius said that when we look into the face of a newborn baby, we see the face of God looking back. Let us pray the opposite, and hope that this Christmas, when we look into the face of the Christ-child, he will recognize the faces looking back at him as parts of God’s good Creation.